Today’s photo was sent in by Suzanne Kelly. 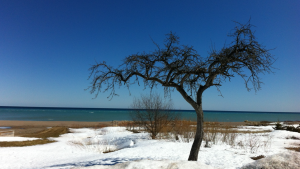 Suzanne took this photo at the beach in Rogers City. She says she can’t tell which is bluer, the sky or lake Huron.